Diminutive New York Knicks guard Nate Robinson beat defending champion Dwight Howard of Orlando in an electrifying slam dunk contest on Saturday night, winning 52 percent of fans' votes. 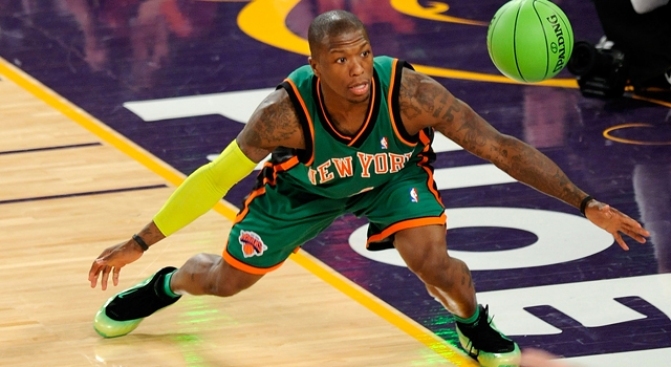 Nate Robinson tugged on Superman's cape — and won. The diminutive New York Knicks guard beat defending champion Dwight Howard of Orlando in an electrifying slam dunk contest on Saturday night, winning 52 percent of fans' votes. Clad in an all-green Knicks uniform with green shoes, the 5-foot-9 Robinson springboarded over the 6-foot-11 Howard to jam. Robinson pitched the idea to Orlando's big man on Friday. "I asked him yesterday in the elevator," Robinson said. "He was like, 'Hey, I'll do it.' I thought he was joking." Howard said he was happy to help him out. "It is all about having fun," Howard said. "Hey, he won fair and square. The fans loved it. We tried to put on a good show. That's what it is all about at All-Star weekend. It doesn't matter who wins or loses." Howard seemed destined for another victory after scoring a perfect 50 on both of his first-round dunks. The All-Star center performed the most theatrical dunk of the night in the opening round. He disappeared into a phone booth just off the court, emerging with a Superman cape, and waved his arms to the crowd as an 11-foot basket was wheeled onto the floor. He then took a bounce pass from teammate Jameer Nelson and tomahawked a dunk as U.S. Airways Center exploded. "I'm not mad or anything," Howard said. "He did a good job. I guess the shorter man will win in a dunk contest because it looks real hard for him. It looks easy for me." Robinson could face an even tougher field if he decides to defend his title in Dallas. LeBron James tentatively placed himself into next year's contest during the television broadcast. Earlier, Miami's Daequan Cook connected over and over again when the 3-Point Shootout went to an extra session. When the long-distance contest went to overtime, Cook found his stroke. The Heat guard posted the best total of the competition with 19 points in the extra round, cruising past Orlando's Rashard Lewis to win the title and end Jason Kapono's two-year run as king of one of All-Star Saturday's marquee events. Lewis sputtered in the third session, missing his first 11 shots to finish with seven points. Cook had forced overtime by hitting his final four shots in the second round of the six-man competition. "I felt this was my opportunity to show people that I should be considered as one of the elite 3-point shooters in the game, so tonight I came out and did that," Cook said. Kapono came up one point short in the second round. The Toronto Raptors sharpshooter was trying to become the third player to capture three straight titles in the event, following former Chicago Bulls guard Craig Hodges, who won from 1990-92, and Boston Hall of Famer Larry Bird, who won from 1986-88. Mike Bibby of the Atlanta Hawks, Danny Granger of Indiana and Roger Mason of San Antonio were eliminated in the first round. Chicago's Derrick Rose capped his Skills Challenge victory with a double-pump reverse dunk. Rose defeated New Jersey's Devin Harris in the final round, navigating the obstacle course consisting of dribbling, passing and shooting stations in 35.3 seconds, 4.4 seconds faster than Harris. "I was just taking my time, going against a great group of guys," Rose said. Cleveland's Mo Williams and San Antonio's Tony Parker were eliminated after the first round. Williams took third with a time of 37.5 seconds after replacing Orlando guard Jameer Nelson, who has a torn right labrum. Parker was booed — no surprise given the Spurs' bitter rivalry with the host Phoenix Suns. The crowd was delighted when he finished fourth in 50.8 seconds after missing several jumpers. Durant faced early elimination after quickly picking up four letters while struggling with his shot outdoors. Mayo had only two letters after knocking out Johnson with an array of shots that included a bucket from the stands, a left-handed jumper and an underhanded free throw. Durant then began to hit from long range, just as he did Friday when he scored a Rookie Challenge-record 46 points to lead the NBA's sophomores to a 122-116 victory over the rookies. He put another letter on Mayo with a heave from behind a table about 30 feet away, and won it with a deep 3-pointer from the left corner to collect the plastic horse trophy. Team Detroit — former Piston Bill Laimbeer, present Pistons guard Arron Afflalo and Detroit Shock star Katie Smith — won the Shooting Stars competition, in which players shoot from six locations of increasing difficulty.